Attend our Museum Open House, 1 pm Saturday, October 22. 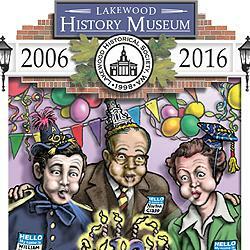 2006—the fledgling Lakewood Historical Society, founded by Cy Happy eight years earlier, leases a storefront in historic Lakewood Colonial Center, finally acquiring enough space to exhibit a few of the treasures donated by generous and historically-minded Lakes District residents. Some of these are incorporated into our permanent exhibits—reproductions of an early schoolroom, a pioneer cabin, Lakewood's first post office, the 1930’s newsroom of the Lakewood Log, etc. Others have played a part in one or more of our featured exhibits—examinations of local history ranging from the rise and fall of local shopping centers...to the impact of the military presence in our community...to a look at the sports and leisure activities engaged in by visitors to what was once Pierce County’s favorite vacation spot. In short, it’s been a busy 10 years at the Colonial Center for your Society. Please join us at the Museum, 6211 Mt. Tacoma Dr. SW in Lakewood, as we toast both the past and an ever more vital and relevant future!